On Sunday, the new home of the York County Emergency Management Agency in Alfred, pictured, was dedicated. ALFRED, Maine — From the 1970s until 2004, a red brick building on Route 4 was home to prisoners in York County. But those people wouldn’t recognize the building today. For one thing, the brick exterior has been covered with four inches of high-density Styrofoam insulation with a white stucco overlay. A transformation has taken place in the building’s interior as well: walls separating cells have been removed to make offices, old carpeting has been replaced with new and glazed windows, new lighting and other energy efficiencies have been added. 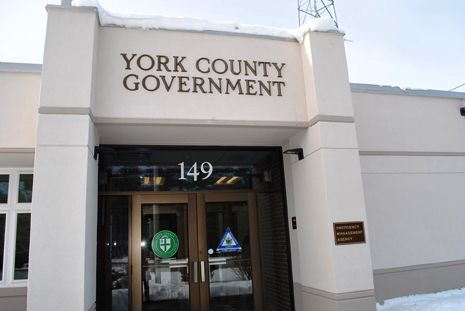 With these changes and more, the old jail has morphed into a state-of-the-art communications center and the new home of the York County Emergency Management Agency. Although YCEMA staff and volunteers moved into the new space in December, the dedication of the building took place on Sunday. During the ceremony, a couple of men who played important roles in the history of the YCEMA and in the creation of its new home were honored. Former longtime YCEMA Director Robert “Bob” Bohlmann was one of those. Bohlmann served as director of YCEMA from 1994 to 2011. Bohlmann was teary-eyed when York County Commissioners Chairwoman Sallie Chandler surprised him when she announced that a board room, one of the first rooms those entering the building see, was dedicated in his honor. “This is a great day,” said Bohlmann. A day, he admitted, he didn’t think would come. “I was the ‘Doubting Thomas’ in the group,” said Bohlmann, claiming he didn’t think it was possible for York County to attain a state-of-the-art emergency management center. However, he said, the county’s Special Projects Director Richard Brown believed in the project. Brown was one of those most responsible for the successful renovation, said Bohlmann. Brown was also one of those surprised when the building’s wellness center, which is still under construction, was dedicated in his honor. Once completed, the wellness center, which all county employees will be able to use, will include exercise rooms with weights, a space for kickboxing and even a sauna in one of the converted old jail cells. The old building, which was once an “eye sore,” has been transformed into “classy office space,” said Paul Shumacher, executive director of the Southern Maine Regional Planning Commission. The commission partnered with YCEMA on the building by helping to secure grant funds that made the renovation possible. The renovation makes it “one of the most highly energy efficient buildings around,” said Shumacher. About $600,000 of a $646,000 grant from federal stimulus money administered by the Department of Energy was used in the renovation. That money was directed to pay for many of the energy upgrades. In order to make the building energy efficient, insulation was applied to the exterior of the concrete building, said Mike Lassel of Lassel Architecture in North Berwick. This method makes it easier to maintain the building’s temperature, said Lassel, who designed the renovations. New triple-pane glass windows were installed, interior lighting was switched over to high-efficiency lighting and LED lighting was used for exterior lights. In addition, he said, a new, high-efficiency heating system was installed. Lassel was involved in the plans for a new YCEMA center from nearly the beginning. Initially, the building on Swett’s Bridge Road, where the agency was formerly housed, was going to be renovated. However, there were so many problems with that building that converting the old jail made more financial sense. “This is an ideal building for adaptive reuse,” said Lassel about the former jail. YCEMA Director Kimberley White-Kaiser said she’s thrilled with her agency’s new office space. “I’m actually the envy of 15 other counties right now,” she said. The space, which is command central for any type of emergency that threatens York County or any of its communities — from floods to hurricanes — should stand the test of time, said White-Kaiser. Its solid construction should allow it to withstand the highest winds that could threaten the county, she said. The old office building was so unstable that whenever a heavy wind blew “it would shake,” said YCEMA Assistant Director Blain Cote. In the new building, the only way to tell that it’s windy is by looking out the window and watching the tree branches bend, he said. In addition to the building’s structural integrity, there are many built-in communication redundancies to ensure the agency will be able to function in any type of emergency. These include ham and public radio systems, fiber and copper telephone lines and multiple Internet lines. In addition to the board room and wellness center, the building includes an emergency operations center with eight stations where emergency calls are taken, a radio room, a meeting room and library for the York County Commissioners, offices for YCEMA staff, space for volunteers and additional space for expansion. Along with federal stimulus money, funds to complete the renovation included $78,000 that was to be used to re-roof the old EMA building, $67,000 from contingency funds for asbestos abatement, approximately $35,000 from a county grant from a reserve insurance fund for the wellness center and a $28,000 grant to the YCEMA to help transfer communications equipment. Journal Tribune reporter Tammy Wells contributed to this story. To see more from the Journal Tribune, visit journaltribune.com.